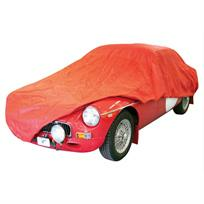 Semi-Tailored Indoor Car Covers - Shaped For A Better Fit. When storing your vehicle indoors a car cover can still be beneficial, protecting it from the damaging effects of dust and damp, as well as helping to prevent accidental scuffs and scratches. Whilst many dust covers are available only in "small / medium / large" type sizing, Supertex® covers are semi tailored for a better fit. If you require free samples of the material or require any assistance regarding size selection, please call us on local rate call number 0333 800 8004. Please ensure you have the dimensions of your vehicle when calling. Please advise us of the vehicle make, exact model along with details of any spoilers, etc in the 'Special Instructions' section of the Checkout. Covers may be returned provided they are in as new condition. Covers returned dirty cannot unfortunately be exchanged.